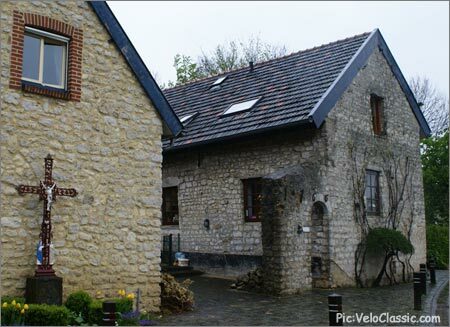 The Cobbled Classics are a hard act to follow, and opening the show for Fleche and La Doyenne might be too much for some. But the Amstel Gold Race is tough enough to stand alone amongst the Spring races, and with 31 climbs peppered over 257kms, a win here ensures lifetime membership in an exclusive club. PEZ rode the key climbs today under soggy skies… here’s a look. Dutch author Johan van der Meulen was known for combining Dutch and English words into sentences he called "Double Dutch". While his writing appeared to be in English, it’s impossible to fully understand without knowledge of Dutch, as his work was based on the literal translation of Dutch idioms into English. 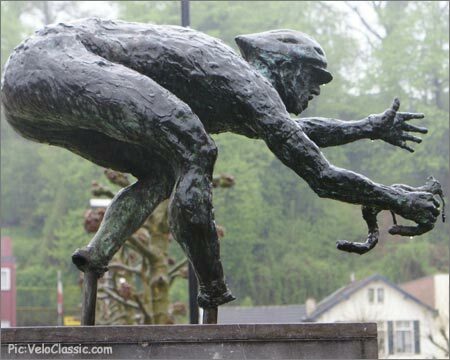 I have a strange feeling Mr. van der Meulen lent course director Leo Van Vliet a helping hand when he designed the Amstel Gold Race. Welcome to Holland. 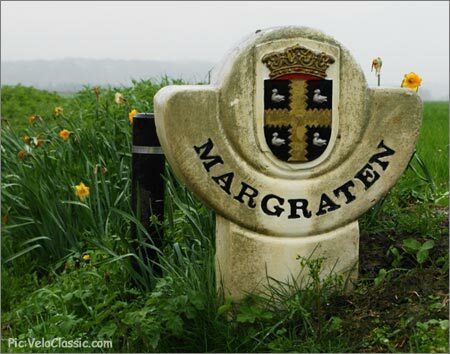 Margraten is at the center of the Amstel Gold course. 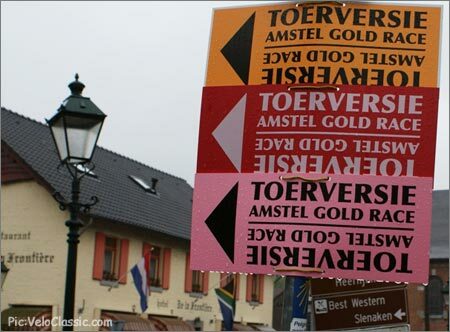 As confusing as that may seem, I’m going to let you in on a straight forward secret - the Amstel Gold Race is every bit a legitimate Spring Classic. Mind you, if it wants to play the name game, it will lose- after all it is named after a beer, and it lacks a historical monument as iconic as the Muur van Geraardsbergen or La Redoute when it comes to defining a Classic. But what the Amstel Gold Race lacks in history, it more than makes up for with its Dutch roots - at first glance it’s completely incomprehensible, a bit illogical, not overly funny, and at the end of the day, all business. And for a bike race in Holland, that’s all that matters. The famous logo of Amstel beer is a Dutch icon and easy to spot. 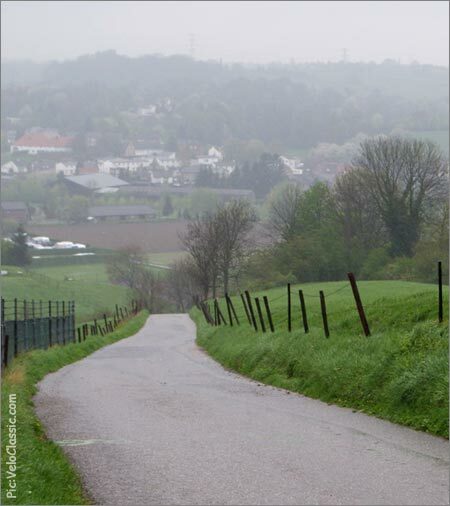 When I first studied the Amstel Gold Race, I was floored by its convoluted parcours. It reminded me of the first conversation I had with a Dutchman I befriended a few years earlier - I walked away scratching my spinning head, cursing his inability to grasp the obvious, unamused at his dry sense of humor, and not impressed with his curiously workmanlike demeanor. Initially, this was off putting, but experiencing it daily as an underlying theme in Dutch life and forcing myself to conform or go mad, I realized I had entered the double Dutch world of thinking (which is completely against my normal ethos of form follows function and can be very tiring). A new level of clarity appeared, granted it only works in Holland, and soon enough the Amstel Gold Race spoke fluent Dutch to me. The race itself includes 25 different climbs- beklimming in Dutch-over 257 kilometers. But in double Dutch fashion, the route consists of three parts scribbled across the lumpy southern province of Limburg, with four climbs covered twice, and the well-known Cauberg three times, including the finish, for a total of 31 climbs. While the rest of the country is criss-crossed with canals, dykes, and wind swept tulip fields, this part of Holland is clearly an aberration, and is more like neighboring Germany and Belgium in terrain. With a relatively small land area, the race has no choice but to zig zag and turn in on itself, so logically- at least to the Dutch- including the same climbs and roads multiple times makes sense. Never mind the 20+ gevarlijke punten, or dangerous points, that are indicated in the race guide with big red exclamation points. The parcours crosses itself so many times that color coded markers are needed. My Dutch friend, who is a PhD in mathematics, told me math never lies, so applying logic to overcome a sense of incomprehension is the key to understanding this race. And there is truth in numbers. Six of the climbs come in the first 92 kilometers - one every 15.2 kilometers. The remaining 25 come over the final 165 kilometers. That’s one every 6.6 kilometers. Breaking it down further, the final hour of racing has eight climbs in 42 kilometers. Now we’re down to one every 5.25 km. At 40 kph, that’s one every 7 Ѕ minutes. Not overly funny, and definitely all business. 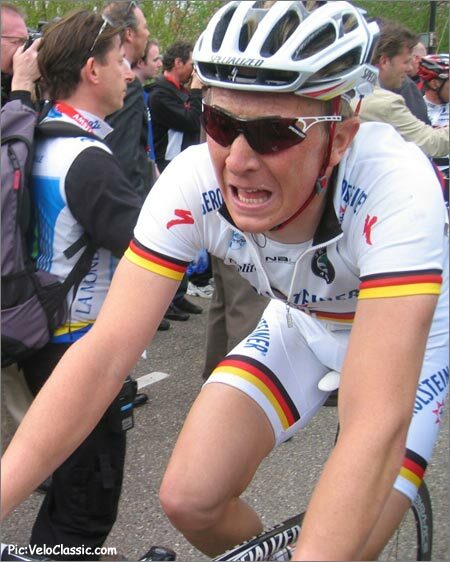 Fabian Wegmann’s face hides nothing as he finishes the 2008 Amstel Gold Race atop the Cauberg. Looking deeper into the final hour of the race, this is where the decisive action will occur, and it will happen fast. Those who have been vigilant throughout the day and have successfully sprinted out of dozens of corners, negotiated multiple roundabouts, tight turns and narrow farm roads, must now conquer Van Vliet’s Double Dutch masterpiece: the Wolfsberg, Loorberg, Gulperberg, Kruisberg, Eyserbosweg, Fromberg, Keutenberg and the Cauberg. In total, that’s 9.2 kilometers of climbing, including a grueling uphill finish sprint. No wonder Fabian Wegmann looked apoplectic last year finishing an impressive 11th. Starting to add up? Narrow roads are abundant. This one leads to the village of Eijs and the climb of the Eyserbosweg. 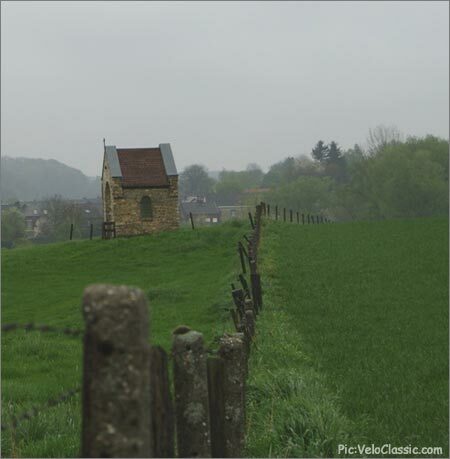 There is a certain synergy that evolves out of this combination of hills that, initially, is imperceptible. It is a case of the whole being greater than the sum of its parts. Each climb has a role, but it is how they are linked that produces the explosive outcome. Applying a bit of math again, I prefer to break the finale into three intervals. The first begins with the 500 meter Wolfsberg, a good setup for the 1200 meter Loorberg, which is long enough for an acceleration to cause a split, before the 600 meter Gulperberg, which is steep enough (16%) to cause the first selection. For those chasing, the tight route through town can be menacing for the fatigued. Quick Step was out for a recon in the rain. Here they're taking on the Gulperberg. Interval two begins with the 1000 meter Kruisberg, its 11% sections setting up the Eyserbosweg 3 km later- 1100 meters with ramps of 16% that can create the second selection. The Fromberg (1600 meters, avg 4.6%) follows immediately, and it is either a good time for the strongmen to keep surging, or lights out for those chasing. Pictures never accurately portray how steep a climb is. Looking down the Keutenberg. The Keutenberg is the penultimate climb, and reeks of the stuff that makes the Spring Classics so great. Long (1700 meters) steep (ramps of 20%) and narrow, means it has the potential to stage the final selection before the 11 km slug fest to the Cauberg, if anyone is brave enough to take the risk. Incomprehensibly, no fans are allowed to view the race here. I always sense an enormous missed opportunity, as it has the potential to rival La Redoute or the Mur de Huy as the symbol of its race. Quick Step still going strong in the rain as they approach the top of the Keutenberg. 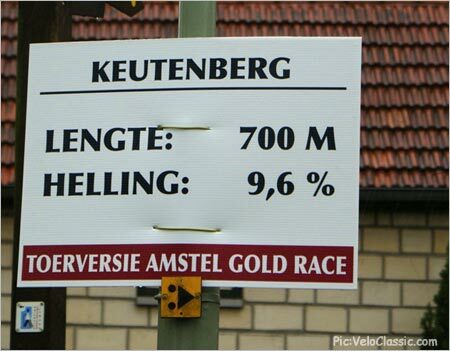 For the Cauberg, the numbers don’t lie - 255.5 km of racing done, 1500 meters to go, full on to the finish, all uphill. This equates to roughly a 3 Ѕ minute interval. Ouch. Standing among the soignuers last year, in the 45 seconds it took for the 1st through 11th placed riders to finish, it was painfully etched on their faces who forced the selection and who went the way of the cross. 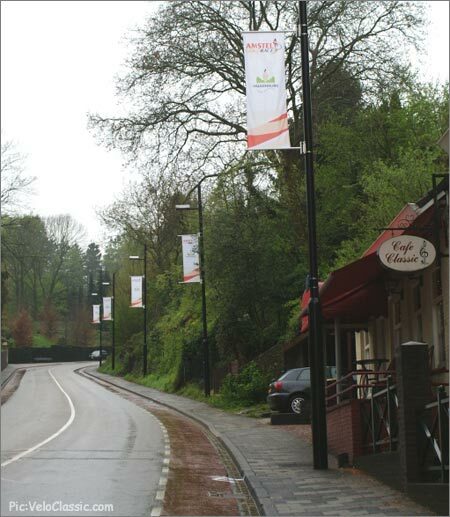 The calm before the storm on the Cauberg. The symbolism is eerie across the latter part of the course, including the descent off the Eyserbosweg. How many riders will be saying their prayers at this point? I don’t see my Dutch friend any more, but I’ve made others who endear themselves with their own interpretation of van der Meulen. As for Van Vliet, I don’t know if he is a mathematician, was a student of van der Meulen, or maybe both. But I do know I’m ready for the double Dutch world of thinking, and from the incomprehensible, Sunday’s race will produce a logical and well deserved winner. Win this race, and your name is etched in Classics history. Peter Easton is an expert on the Spring Classics. 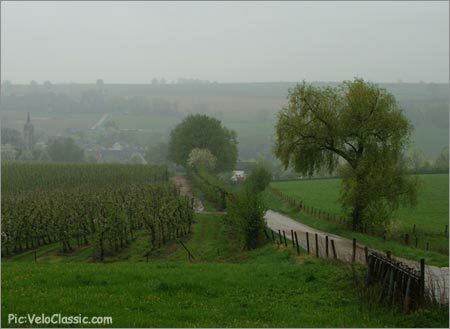 You can catch up with him and all the Classics on the roads of Belgium and Holland with Velo Classic Tours. www.veloclassic.com.